Here is another interesting detail item that is now available. 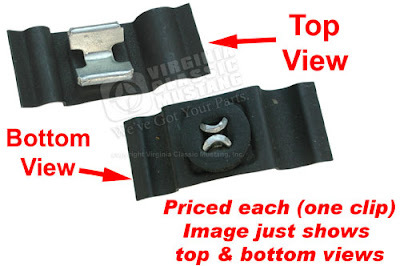 This is the clip for the speedometer cable. I have seen them on all 65-66 4 speed transmission equipped Mustangs. This clip was also used on other applications. It is interesting to note that the clip is made to hold two different sized lines, but it was used on the passenger's side to hold the 4 Spd. Speedometer cable to the firewall area. 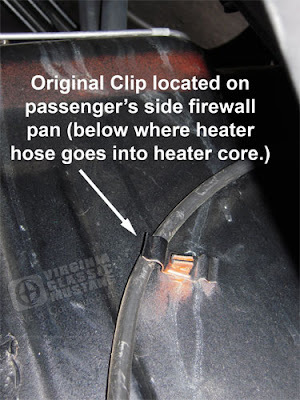 The image below shows an original clip on a 1965 Mustang that has never been been removed. Our part number is IN7512. Don't forget about our IN7511 clip that fits on the crossmember also. Also don't forget about our complete selection of speedometer cables with the correct grommets.